Thread: No recent love for the Prestige Sessions here? All I'm seeing is a smattering of posts on the new Sessions. No offense mind you as they look like a great kit for sure. While I have your attention: Does anyone play a Prestige Session snare in here? The one I got with the monster kit I just purchased sounds incredible to my ear. It's the original 6.5 X 14 that came with the kit. I slapped some Gibralter 42 strand wires on it and it absolutely KILLS with a coated vintage Emp on top and Ambo snare side reso. I think I even like it better than my 8X14 Ludwig chrome Supralite which is a great snare in it's own right (especially for $200!) Anybody? Last edited by Niteclub; 03-26-2019 at 02:10 PM. Would love to see pics of your session kit. Sadly never played a session snare so I can’t contribute. Hello DrumPlayerFTD! I'm south of you in Saugerties. Here are two recent pics of BIG TEAL. My 20 yr old mid-life crises kit. Overall it's in great shape and came with the aforementioned 6.5X14 matching snare that I have really been digging! I have a 1998 Prestige Session Select in black mist, but when I bought it, I decided to upgrade the snare to a Masters Custom 14 x 6.5 in the same finish. Thanks! Your kit sounds nice too. I've played some pretty decent poplar sets myself in the past. 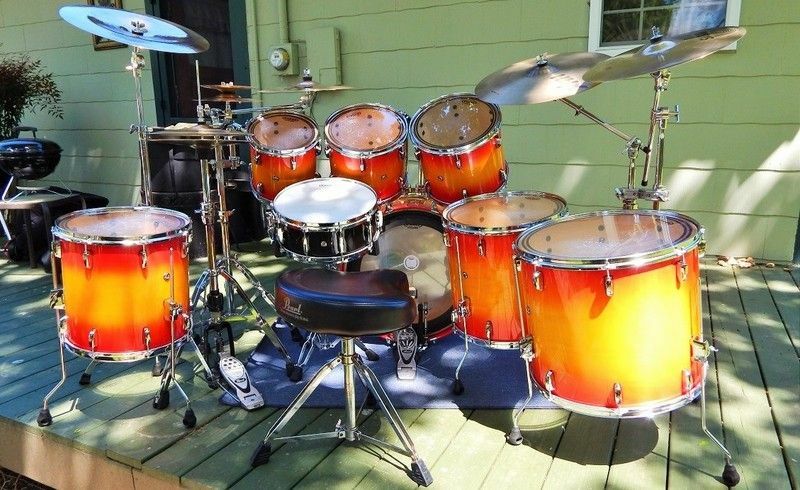 Most recently a black sparkle wrapped Ludwig Accent Drive kit and before that a really nice sounding PDP 7 pc in Tangerine sparkle wrap. Hey Bodgit, Do you still have the Session snare or did you sell it off? If you haven't heard it in a while, I urge you to take another listen. Even though it isn't pure malple like your Masters, I honestly believe the mixed maple/mahogany (luan) shell adds some more bottom end warmth making it sound like an 8" depth snare to my ears anyway. There was a Prestige Session snare in the shop when I bought my Prestige Session kit. I didn't have the extra cake at the time to buy it with the kit. Great sounding snare though. Kinda hurt not to be able to get it too. It sold before I could get it. There's a another 16x22 matching kick that goes with the kit. 'Goes" is the operative word since I plan to sell these drums after I get a Session Studio Select in Antique Crimson Burst later this year. Last edited by Ron Gerber; 04-15-2019 at 09:09 AM.